Replacing Skype for Business Online with Teams will take place over a period of months, or even years. As you know by now, Microsoft Teams is replacing Skype for Business Online as the UC client for Office 365. Where Skype for Business Online today provides access to chat, conferencing, and PBX telephony features, Teams will provide access to all that plus Slack-like, Spark-like, Circuit-like, WhatHaveYou-like team collaboration. First off, replacing Skype for Business Online with Teams won't happen suddenly for most enterprises. It will take place over a period of months, or even years. There'll be an awkward period where Teams will be first doing a little, then more, then most, and finally all of what Skype for Business Online has been doing UC-wise for the past few years. Eventually, the Skype for Business Online client will disappear and only Teams will remain. Until then IT departments can designate which telephony features traditionally part of Skype for Business Online will be available from Teams. They'll do this via the new Skype for Business Online management tool called Teams interop policy. Via this tool, IT can assign either Teams or Skype for Business as the preferred app for chat and calling. If Teams is set up as the preferred app, then incoming calls ring the Teams client and incoming chats -- whether from Teams or Skype for Business users -- trigger a Teams popup. The Skype for Business client is still there to use, and in some cases -- at least in the near term -- it will be needed. But users are now being weaned off of it in favor of Teams. IT can designate a preferred UC app on a per-user basis or across the entire organization. In the latter scenario, Teams can first be set up as the default UC client just for IT, letting IT test it and work out kinks as needed. Then IT can make Teams the default UC client for a pilot group outside the department, making sure users are comfortable with the app before making it the default client company-wide. This is fantastic since different companies are certain to embrace Teams at different speeds. IT departments can give power users Teams complete with whatever Phone System features it supports, while holding off delivering it to employees who aren't ready for it. Interop isn't just between Teams and Skype for Business Online. 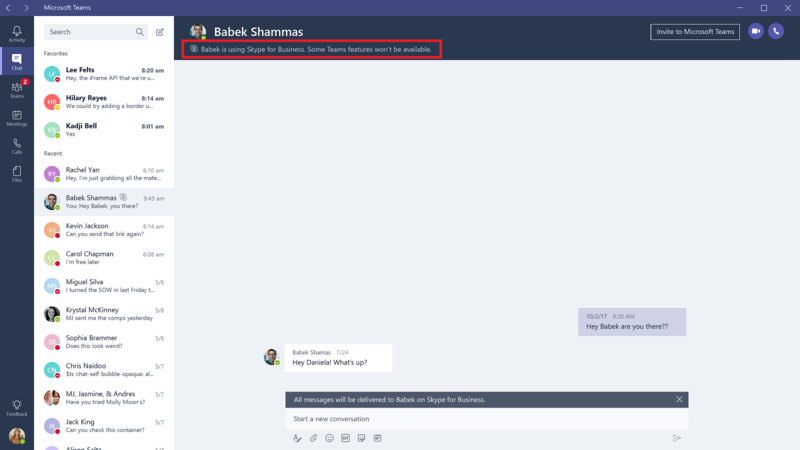 It can be between Teams and Skype for Business Server too... but only if Skype for Business Server connects to Skype for Business Online in a hybrid topology. So, if you have a big Server deployment and want it to work with Teams, you've gotta have Online in the mix. Because Microsoft wants all of you Server shops off of Server and onto its cloud toot sweet. Further, when a Teams user chats with a Skype for Business user, that chat session isn't persistent. And a point-to-point call between a Teams and Skype for Business user can't be escalated to a multiparty call that includes a mixed set of users. These restrictions may feel very... well, restrictive. But we should remember that in September 2017 Microsoft hit the reset button on its UC product strategy. Two years ago, the company was at the beginning of a long-term roadmap that led to Skype for Business Online Cloud PBX reaching (and possibly exceeding) feature parity with the richer set of Enterprise Voice features that have long been available in Skype for Business Server. Microsoft has since scrapped that plan. Now Microsoft is at the beginning on a long-term strategy that leads to Teams Phone System reaching (and possibly exceeding) feature parity with the Phone System (nee Cloud PBX) features that have been available in Skype for Business Online. Over the next several months we will see many -- perhaps even all -- of these restrictions melt away. And after that, as Teams takes the reins from Skype for Business Online and becomes Office 365's sole UC client, interoperability between the two will be a moot point. Hopefully at that point Microsoft will start to address interoperability between Phone System and third-party PBXs of both the hosted and on-premises variety. Because with Phone System targeted at enterprises, not SMBs, complicated, multivendor telephony environments will be the norm. Certainly some will take an "out with the old, in with the new" approach to Phone System. But many more will need to transition more gradually -- as gradually as Microsoft is expecting businesses with Skype for Business Server Enterprise Voice to transition to Teams Phone System. So interoperability really needs to be about more than making old and new Microsoft tech work well together. Learn more about Team Collaboration at Enterprise Connect 2018, March 12 to 15, in Orlando, Fla. Register now using the code NOJITTER to save an additional $200 off the Early Bird Pricing, which expires this Friday, Feb. 16, or get a free Expo Plus pass.